Do you judge the people you help ~ for needing help? Of course not. But how do you feel about accepting help? Do you feel a little queasy when someone offers to do something for you? Can you call people and ask them to pick up some slack for you when you’re under the weather? Or do you feel guilty for taking the sick days your job offered you when you were hired? How do you respond when someone wants to buy you something ~ just because they love the feeling of giving? Asking for help has been almost impossible for me most of my life. Accepting help when spontaneously offered hasn’t been much easier. But, boy am I a giver. I’ll help you with just about anything. 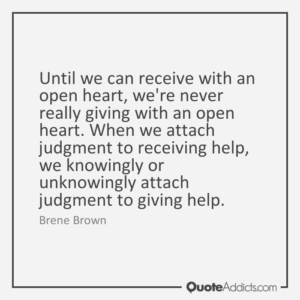 And it wasn’t until this quote from Brene Brown until I realized how I might really be viewing the giving I was doing. Did I believe I was too strong to receive? Or worse, too good to be that ‘needy’? I was basically dividing the world into The Givers and The Takers. Talk about queasy. There are a lot of ways we can form beliefs about receiving. In my family, asking for help just wasn’t done. We didn’t need help. We could do it on our own. We didn’t want to owe anybody anything… but we would step up happily to help when someone in the community needed help; generally the elderly, the ill or the grieving. Receiving is part of giving; they are two sides of the same coin of abundance. Living an abundant life is living in a state of generosity and grace. When we learn how to receive with joy and a sense of worthiness, we gain an ease in our giving. Gain a little momentum with these things and our lives would be very full and sweet. So, if we’re in a space of reluctance, or resistance to receiving, how do we change that? For me, I saw things starting to change after I started saying “Change Me Prayers”. Tosha Silver is an amazingly wide awake soul who writes about her experiences with letting The Divine lead her through every experience. Her book “Change Me Prayers” is insanely fun and easy to read. She is an animated storyteller and has some hilarious stories that illustrate her beliefs about the power of inviting The Divine into your daily life. “Please Change me Divine Beloved into One who can feel wildly open to receiving. Let me know my own value, beauty and worthiness without question. Change me into One who can fully love, forgive and accept myself, so I may carry Your Light without restriction. When I started using this prayer, opportunities to receive flooded my days. People offered to help me with everything from mowing weeds to taking out an orchard for me. Let me be clear on this next piece… I didn’t magically LOVE receiving. It was hard! But, the opportunities arose and I could see clearly the choices I was making. I even said yes to some things. And the moments where I refused help as a knee jerk reaction, I realized it right away. And I made a decision that next time someone offers to help me to the car with my groceries, I’m going to give it a whirl. Part of this equation is the fact that we understand the joy of giving. It truly does give us happiness. So, why do we wish to deny that happiness to someone who wants to help us, or to give us something? Saying yes will open us up to a whole new experience of abundance. If good things are going to come to us, shouldn’t we be good at accepting them? We say we want more good things in our lives; money, fun, security… but we don’t exercise the muscle that will allow the more we’re asking for to show up. We need to practice saying yes to the good stuff. Give.Receive. Repeat. Let’s try it.